The global and local economic environment remains challenging. In this context Barloworld continues to produce financial results that attest to a sustainable business model. What lies behind this performance? 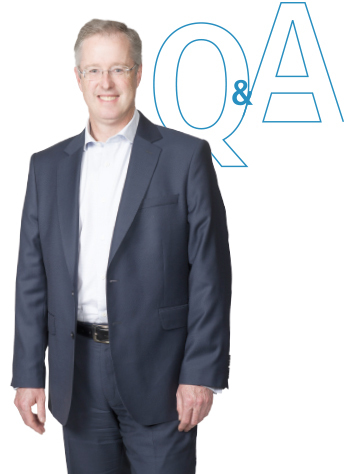 In a challenging environment it was pleasing that Barloworld grew headline earnings per share from continuing operations (before B-BBEE charge) by 8%. The resilience of our business model lies partly in the diversity of the geographies and industries in which we operate. Coupled with this, our aftermarket revenues have proved robust during the downward mining cycle as customers continue to consume parts and maintain existing fleets of equipment. This attests to the passion and focus of our service and support teams in producing innovative solutions to maintain customer relationships through challenging times. What were the group’s most significant achievements in the past year? We were pleased with our improved safety record which included zero work-related fatalities. Our southern African and Russian Equipment operations put in a resolute performance against the backdrop of the weak global mining environment, buoyed by the tenacity of the Spanish business in returning to profitability after several years of significant market weakness. We delivered another good performance in both our Automotive and Logistics divisions and were recognised by Avis Budget and a number of our Automotive OEMs through numerous awards for performance excellence. Barloworld was named as one of the world’s top performing Cat dealers at Caterpillar’s Global Excellence Awards held in Dubai in April 2015. Barloworld Finanzauto received a Global Dealer Excellence award for Power Marine, one of only two dealers worldwide to win this accolade. These awards underscore the alignment between the Equipment division and Caterpillar, which is critical in jointly developing innovative strategies for our continued growth and success. 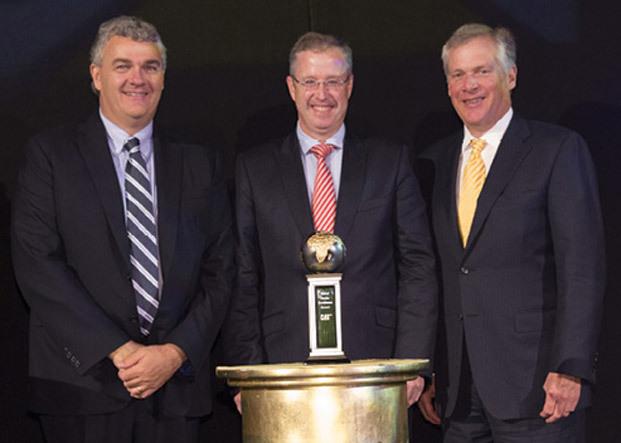 From left to right: Rob Charter, group president, customer and dealer support, Caterpillar Inc; Clive Thomson, chief executive officer, Barloworld Limited; Doug Oberhelman, chairman and chief executive officer, Caterpillar Inc. Caterpillar Global Dealer Excellence Awards, April 2015. The Automotive business continued its journey of strategic acquisitions with the Budget brand joining car rental and Avis Fleet expanding into east Africa. How is this likely to contribute to future growth? The Automotive business continues to deliver a strong result despite weakness in new car sales. Organic growth in our car rental business, complemented by the acquisition of the Budget licence with effect from 1 March 2015, has provided us with a dual branding strategy that will result in revenue enhancement and cost efficiencies. Avis Fleet continued to deliver a solid performance on the back of a number of long-term fleet leasing contracts and expanded its presence into east Africa to provide a platform for future growth. New vehicle sales declined in Motor Retail but the result was bolstered with pleasing growth in parts revenues and service hours sold. The Logistics business has grown substantially in the last 18 months. What has driven this growth and how does it position the business for the future? Our strategy to drive organic growth combined with niche acquisitions that provide our clients with access to a broader range of supply chain management services remains successful. Significant contract wins during the year, including Telkom, Kelloggs, Weir Minerals Africa, Eskom, Makro, Glencore, PPC Zimbabwe and Total SA to name a few, have broadened our customer base. Many of these are long-term contracts that position the business well for future growth and enhanced financial returns. The extended mining product range (EMPR) business in the Equipment southern Africa division continued its good performance. Can you comment on the resilience of the business model in the current downturn? In 2014 we completed significant new EMPR fleet deliveries, most notably to First Quantum Minerals’ (FQM) Sentinel project in Zambia and Swakop Uranium’s Husab operation in Namibia. With these and other sites now in full production, the growing installed population of EMPR machines is augmenting our mining product support revenues. While mining companies have curtailed capital expenditure, mines continue to drive up production levels using existing Caterpillar fleets thereby providing a strong underpin to our parts, service and component rebuild revenues. 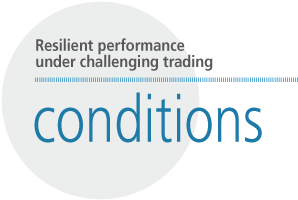 How are the geopolitical challenges in Russia affecting performance? The Russian economy has been impacted in the past financial year by the significant decline in the oil price, a weak mining environment, as well as economic sanctions resulting from the Ukraine situation. However, aftermarket growth and tight cost control has contributed strongly to a very creditable performance from the Russian Equipment business. Parts and service revenues make up over 60% of total sales compared to 25% in 2006. This indicates an exceptional effort by the team in Russia to forge successful long-term customer partnerships in the mining sector since its launch as a greenfields business with no installed machine population in 1998. 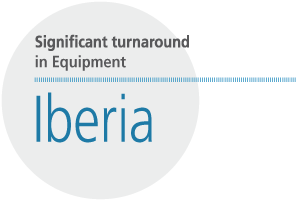 The Equipment business in Iberia has been impacted by a protracted economic recession that has lasted seven years. With the measures taken over that period to right-size the business bearing fruit in this year, how do you see performance going forward? The 2008 financial crisis was followed by a protracted decline in the Iberian construction market and the cost base in our Spanish and Portuguese operations has been reduced by approximately €79 million per annum since 2008. The disciplined and prudent management of this business through a very difficult period positioned us well to return to profitability in 2015. Spain is now one of the fastest growing large economies in Europe, ahead of Germany, France and Italy. The macroeconomic indicators have turned positive and we believe the return to profitability in 2015 will gain traction in the years ahead as the construction equipment market in Iberia continues on a recovery path. Barloworld Global Power has implemented a strategic growth plan together with Caterpillar. What does this plan involve and is it gaining traction? We are working closely with Caterpillar to develop a long-term growth plan for our power systems business which includes identifying opportunities in the electric power generation, marine, oil and gas and industrial market segments in southern Africa, Iberia and Russia. We are now in the early stages of executing this plan and are confident that the longer-term growth potential in each of these markets remains exciting. While the weak oil price has negatively impacted market demand in the oil dependent economies of Russia and Angola, we have benefited from the demand for prime and standby electric power generation in South Africa due to loadshedding. Barloworld Power and Caterpillar have agreed that certain ranges of Cat generators will be locally assembled at our Boksburg facility in South Africa and we are exploring further opportunities for localisation that will be attractive for our customers and to grow our business. What measures are you looking at to improve profitability in the Handling division? The southern African agricultural business was negatively impacted by the drought in South Africa and Zambia while the loss-making Russian agriculture business was sold in September. The Hyster forklift division has been rightsized over the last few years with our exit from the US, UK, Belgium and Holland and the remaining South African operation continues to be profitable. Further initiatives are under way to reduce the cost base and position the business for improved returns. The group’s Broad-Based Black Economic Empowerment (B-BBEE) transaction of 2008 was closed out in the year under review. What was the impact of this? General Staff Trust shares to the value of some R281 million vested in 11 531 Barloworld employees in November 2013. The Education Trust supported 58 bursars for tertiary education to the value of R6.5 million. In July 2015 we obtained shareholder approval to close out our 2008 B-BBEE transaction on terms agreed with our six strategic black partners and three community service groups. A total of 2.0 million shares were issued in November 2015 in respect of the close-out and, as previously indicated to shareholders, an equivalent number of shares will be bought back in the market to minimise shareholder dilution. The black managers trust was also closed out in the period, with a cash payment of approximately R46.4 million made to 183 participants in the trust as recognition of their contribution over the past seven years. The group incurred a total pre-tax charge of R251.3 million (112 cents per share after tax) related to the close out of the 2008 B-BBEE transaction. In 2015 Barloworld launched its new Vision 2020, “Inspiring a World of Difference”. How does this vision speak to your strategy for sustainability of the business and the concept of shared value for all stakeholders? We aim to inspire a world of difference for all of our stakeholders, including shareholders, employees, customers, our principals and the broader communities in which we operate. This is a simple but profound message that resonates not only across our diverse business units but also with every employee of Barloworld, no matter what their role. “Inspiring a world of difference” means something to all of us. Our Vision 2020 also recognises that to be sustainable we must deliver shared value for all stakeholders. This means driving economic, social and environmental value simultaneously and in a balanced manner. Take, for example, the Bronkhorstspruit Biogas Power Plant, where biogas is being produced from cattle manure and converted to electric power using Caterpillar gas generator sets supplied by Barloworld. The electric power will in turn be consumed by BMW’s Rosslyn plant near Pretoria. This drives environmental value through renewable power, social value through employment opportunities across the value chain, and economic value for Barloworld Power, Caterpillar and our shareholders. Barloworld’s component rebuild facilities in southern Africa, Iberia and Russia remanufacture critical Caterpillar machine and engine components. This solution drives economic value for customers due to a lower cost and reduced machine downtime, environmental value through the benefits inherent in recycling, and social value through employment and technical training opportunities in our remanufacturing facilities. Through innovative thinking and harvesting rainfall, our Car Rental operations use minimal water from the municipal system at our wash bay facilities in major centres. This delivers economic value in terms of cost savings, has environmental benefits through conserving and recycling a precious natural resource, and drives social value by responding to the water shortage in the city. What targets form part of your Vision 2020 to gauge the creation of shared value for all stakeholders? 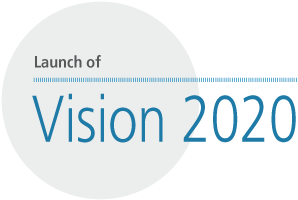 A number of financial and non-financial targets have been set as part of Vision 2020. The aspirational financial targets include aspects such as net operating margin, return on equity and return on net operating assets which aim to deliver economic value by driving improved returns to shareholders. Non-financial targets cover people including safety, employee engagement, skills development and productivity; diversity and inclusion including race and gender; and sustainable development including energy consumption, emissions intensity, water efficiency improvement, waste management and corporate social investment. These aim to deliver enhanced social and environmental value to the benefit of our customers, employees and other stakeholder groups. Tangible annual aspirational targets are being set against key performance indicators in all these areas over the five-year plan period. All metrics used to measure our targets will be published in our integrated report. Value creation for and through Barloworld people driven by your established employee value model was a strong message at the launch of Vision 2020. Do you believe this will stand you in good stead in meeting these exacting targets? An engaged workforce is at the heart of delivering value. If our employees are engaged, inspired and motivated they will deliver value for shareholders, customers, principals and the communities within which we operate. We have formalised our people management approach through our Integrated Employee Value Model, which addresses the key elements driving employee engagement and business productivity. Your strategic growth segments remain the same as in the previous five-year plan – mining, infrastructure, power, agriculture, automotive and logistics. What are the reasons for this? We believe each of these segments provides excellent long-term growth potential. While some industries are cyclical by nature, our geographic diversity and business model provide resilience through the cycles. Within each segment we are continuously exploring new opportunities for growth, expansion and diversification that meet the group’s required hurdle rates of return. Barloworld continues developing its strategy to leverage technology that will deliver productivity and performance benefits to customers. Can you elaborate? Leveraging technology will allow us to do things differently to deliver enhanced customer value and drive growth. Data analytics is an important strategic thrust across the group. We are increasingly connecting assets in the field to provide real-time information that can be used to improve maintenance and sustainability for customers. By predicting equipment failures, enhancing fleet management practices and improving job site efficiencies, we are able to improve customer productivity and performance while also driving our aftermarket revenues. We are also implementing autonomous solutions in Russia with Caterpillar mining trucks that are operated remotely and are delivering safety and productivity benefits. In the Automotive space we are achieving excellent results from our online used vehicle trading platforms. These are an important channel for disposing of used vehicles rolled out of our fleet, car rental and motor retail businesses which are available through these online wholesale and retail platforms. In Barloworld Logistics we are increasingly using technology to improve driver safety within our commercial vehicles and for modelling and improving efficiency of customer supply chains. A drive towards diversity and inclusion is under way throughout the business. Why is this so important to Barloworld? A diverse employee base provides a diversity of thinking and ideas, which improves the quality of our decision-making and ultimately drives enhanced business performance. Diversity and inclusion is an important strategic thrust throughout our global operations embracing racial diversity, gender equality and localisation. We are enhancing our focus to ensure that women thrive and succeed in our traditionally male dominated businesses and are seeing higher numbers of women entering our apprenticeship programmes. We are focused on B-BBEE in a South African context and are evaluating all aspects of the new dti codes of good practice. We are pleased to report that Barloworld Limited maintained a B-BBEE rating of Level 2 and remained in the top 20 of the JSE most empowered companies in an independent survey. Corporate social investment helps deliver positive social outcomes by playing a leading role in communities. Where does Barloworld feel it can have the most positive impact? Our corporate social investment focuses on community upliftment with a bias towards education, which we see as essential to long-term capacity building, economic growth and social stability. Barloworld is also proud to be associated with the Nelson Mandela Children’s Hospital under construction in Johannesburg. We provided a fleet of Cat rental machines for the earthworks phase, as well as an Avis-branded passenger vehicle, and we have donated generators to provide standby power for the hospital. I participated in the 702 Sun International CEO SleepOut in Sandton on 18 June. This initiative raised approximately R26 million for Girls and Boys Town, making it the largest single fundraising event in South Africa’s history. We have ensured that all of our employees are responsible for the sustainability of our business, every day, by including “Sustainability” as one of our core values. Corporate social investment is an important element of this value and an integral part of responsible corporate citizenship. What is your outlook for 2016? We anticipate that the mining environment will remain difficult in 2016 due to weak commodity prices and low levels of capital expenditure. In this context, we expect our aftermarket revenues in southern Africa and Russia to show continued resilience and underpin our revenues in the coming year. The macro-economic indicators in Iberia are positive and improving and we expect to see further progress in driving business profitability in the year ahead. The automotive sector is likely to be weaker in terms of new vehicle sales, but we expect the car rental and fleet businesses to provide a stable platform for growth in the year ahead. Logistics should deliver an improved result on the back of the new contracts secured in 2015 and the sale of loss-making businesses in Germany and Spain. Similarly the Handling division will benefit from the sale of the loss-making agricultural business in Russia. While trading conditions remain challenging in certain of our businesses, we are taking appropriate strategic and operational steps which will position the group to make solid progress in the year ahead. I would like to thank my executive management team for their hard work and support during the year. Special appreciation goes to Martin Laubscher who retired from the company at the end of February 2015 due to health-related reasons after making an outstanding contribution to the group over 28 years. 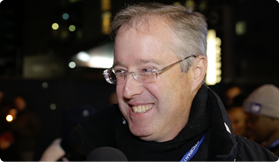 Barloworld Chief Executive, Clive Thomson, participated in the CEO SleepOut that took place on 18 June 2015. It was a unique event for him and many of the CEOs who participated. So this was a sleep out with a difference; different because it took place on the streets of Sandton and because it was done for a good cause. The aim was to raise awareness and funds for the most vulnerable in our society, specifically for Girls and Boys Town that caters to the needs of abandoned, homeless and abused children; a worthy initiative that we could only but associate ourselves with as Barloworld. All the participants came prepared in terms of their best efforts to keep out the cold with the expectation of early morning temperatures of zero and below. They had clear instructions to bring nothing but the clothes they were wearing. They filed in to Gwen Lane in Sandton at 18:00. At this point most were having some trepidation about what to expect but there were good spirits all round and a general sense of camaraderie for a good cause. 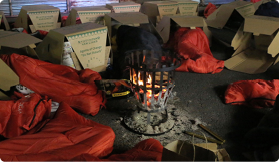 As the clock struck midnight the Radio 702 broadcasters and the various video crews and cameramen departed, the lights from the street stalls were switched off and all had to lay out their make-shift beds on the street from the cardboard boxes that had been provided. There were varying levels of creativity in making the most comfortable bed possible. Needless to say few got much sleep, strewn haphazardly over the street. As the city woke up, when the early morning street cleaning trucks started to rumble and emit their safety warning signals, approximately R26 million had been raised for this initiative and made one interrupted night’s sleep and discomfort a small price to pay. As Barloworld we have always understood our broader role in society, and that our long-term success as a company is linked to thriving communities, where people are cared for, educated and employed and so we raise our hand whenever we can to be part of driving positive change. Our vision to Inspire a World of Difference for all of our stakeholders touches on many different facets of our existence as an organisation. Making a difference to our communities, as one of our stakeholder groups, is an important aspect of making our vision a reality.